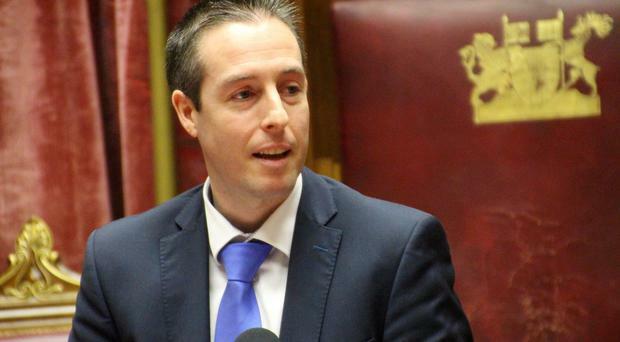 Paul Givan has joined Edwin Poots and Jim Wells as a hate figure for self-styled liberals across Northern Ireland and, like them, has inspired an online petition against something close to his heart - his Private Member's Bill to put in place a "conscience clause". While he would argue that it is about protecting the rights of those with particular beliefs based on their Christianity (beliefs shared by him and many of his DUP colleagues), his opponents contend that it is about giving those people the right to opt out of equality legislation and discriminate against homosexuals. They see this as just another manifestation of what they regard as DUP bigotry and "throwback opinion". Stephen Fry has now joined the debate, accusing "the religious right of twisting truth to present themselves as victims" and urging his eight million social media followers to sign the petition. He then responded to criticism from Edwin Poots with "to be slammed by the bigots of the DUP is to be bathed in light and kissed by angels. I am content". Givan's opponents will also be content because Fry's intervention will add thousands more signatures to their petition. The roots of the "conscience clause" lie in the Ashers "gay cake" furore. It is an issue which matters to the DUP, so much so that Peter Robinson devoted a significant section of his recent annual conference speech to it, followed by a collection afterwards to help the company meet their pending legal expenses. In other words, whatever Givan's opponents think and irrespective of how much his bill appals them, it is clear that the DUP regard this as a vote winner. And he has been chosen as their champion. Givan is regarded as one of the DUP's rising stars. He was gifted his Lagan Valley seat in June 2010 when he was co-opted to replace Jeffrey Donaldson, but went on to win it quite comfortably in the 2011 election. Some regarded his removal as chair of the Assembly's Justice Committee in September as some sort of "punishment" for supporting Edwin Poots after his "Robinson will go within months" comments on the Nolan show, yet the profile building which will flow from his Private Member's Bill suggests that Robinson isn't holding a grudge. This sort of stuff isn't entrusted to someone who doesn't have the complete confidence of the DUP leadership team. Paul Jonathan Givan was born in Lagan Valley Hospital on October 12, 1981. His father, Alan, was a member of the Prison Service at the Maze and later Maghaberry, retiring two years ago. His mother, Elizabeth, has worked as a secretary in both the private and public sector and is still working. He has two brothers (Mark, the older one, works in the construction industry and Philip, is an engineer in Belfast) and two younger sisters (Ruth is a former speech and language therapist working in London and now on a two-year training course with her local church, and Jessica is completing a PGCE at the University of Ulster). As a boy most of his holidays were in caravans and tents across Ireland and Great Britain and many Saturdays were spent at his grandfather's farm in Killyman, near Dungannon, "learning and experiencing the farming way of life". His education included Laurelhill Community College, Lisburn Institute (an HND in Business and Marketing), a business studies degree at the University of Ulster and an advanced diploma in management practice. Like so many people who became involved in the DUP it came as a result of listening to Ian Paisley - at an anti-Agreement rally in Kilkeel: "He captured me emotionally for the DUP and Peter Robinson's and Nigel Dodds' forensic analysis of the failing of the Agreement captured me intellectually," he said. "The DUP spoke for ordinary people and represented my values in a way no other unionist party did." His grandfather and two great uncles were founding members of the DUP in South Tyrone and his father was a member when younger, but not after he moved to Lisburn and joined the Prison Service. Both his mother and father are now members of the Lagan Valley Association and his father was elected to the new Lisburn and Castlereagh 'super-council' in May. His first experience of "real politics" came when he was 18, working as a part-time assistant in Edwin Poots' constituency and Stormont offices. He was later to work as a special adviser when Poots was DCAL minister between 2007-8 and then again between 2009-10 when he was DoE minister. He stood for the Lisburn Council in 2005 - aged 23 - winning a seat. In the break between serving as a special adviser he was public affairs manager for the Federation of Small Businesses. On December 29, 2004, he married Emma. They started dating when they were 17: "She knew my interest in politics but wanted me to get a 'normal' job. She isn't as political as me, thankfully, even though her grandfather was a former Ulster Unionist councillor in Lisburn." They have three children, Annie (7), Hollie (5) and Maisie (2). Givan presents his "conscience clause" proposal as a means "of finding a way in our society where we can make space for and accommodate clashing rights and values. It is needed to stop the civil persecution of people of faith so they can be valued citizens and participate fully in society. It is also needed to defend the Universal Declaration of Human Rights which upholds the right for people to practice their faith and that means not being confined to one hour on a Sunday at church". On the Nolan Show on Thursday he dodged a question about whether he regarded homosexuality as unnatural, arguing that his answer would distract from the real purpose of his bill. Yet in dodging the question he probably fuelled the suspicions of those who believe that he personally and the DUP collectively are anti-homosexual. There is also some confusion about the precise impact a "conscience clause" would have in terms of what would and wouldn't be permissible on business premises owned by Christians. One barrister told me that "it could reach the point at which supporters of a conscience clause would have to put notices on their shop windows to let everyone else know their views. This, if passed, would be extraordinarily difficult for locals, as well as particularly confusing for the tens of thousands of tourists who come here". In response to my comment that it would be better if the church and state didn't mix, Givan responded: "I agree, the state should not be a church and vice-versa, and in Northern Ireland the state is not a church and nor does it promote a church. Alarmingly, though, it is agencies of the state such as the Equality Commission that drive an anti-religious agenda. The issue for me is what freedoms the state allows churches/religion to be involved in society". While arguing that it would be an "absurd proposition" to say that atheists shouldn't be involved in politics, he also says "when I walk into Stormont I don't leave my values at the door. My religious beliefs seek to influence every aspect of my life from trying to be a good dad, husband, citizen and politician. "We all have values shaped from a belief in something. The question is whether that belief is good for society and in a democracy it is the people that decide". Givan clearly thinks that his bill is at one with his own beliefs and conscience, as well as resonating with the sort of voter who backs both the DUP and broader unionism. It will be the Assembly that decides the fate of his bill and the electorate of Lagan Valley (and further afield) who decide his electoral fate and that of his party. The people who oppose the socio/moral platform of the DUP will continue with their online attacks, scorn and petitions, yet there is very little sign of them seeking the political/electoral mandate that Givan and others have. When it comes down to it, the only real change they will deliver is when they prove that they have a bigger mandate than those they oppose. If they don't like Givan and the DUP then maybe it's about time they stopped huffing and puffing on their own moral high ground and took them on at the ballot box?